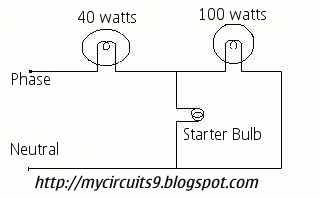 then connect the starter bulb parellaly to the second bulb (otherwise starter will burst out) and check out the starter must be in middle of two bulbs. to power supply (230v single phase 50hz). By covering the bulb with colour paper we can use this to decorate christmas trees. Please refer circuit diagram for more info. If it didnt works please interchange the bulbs1&2.